In the past 4 years, I have lost my father, my big brother, and most recently, my mother. Suddenly, I am an orphan, the lone survivor of my sweet, loving childhood family. And so it falls to me to be the caretaker, cleaner-outer, and custodian of the family "stuff". I have helpers of course. My own nuclear family has been a tremendous help both as emotional support and as a motivated labor source. Every work session at Mom's turns up emotional treasures that may cause laughter, tears, WTH's, or combinations of these. "So where is the confession, get to the confession part!" Patience grasshopper... I'm telling a story here. The job of cleaning out the Dad's garage fell to me. His garage was a time capsule whose contents had not changed substantially since the year 2000. Most of the stuff in the garage had sat undisturbed since the late '80s and '90s. Much of the stuff in boxes and on shelves was easily tossed as junk, but not before inspecting everything carefully. The old musty cigar box on in the rusty locker might contain treasured photographs of teenage Dad (it did) or photos of Mom and Dad as twenty-somethings (did that too). You get the idea ... go slow, inspect everything. At one point in this adventure, I looked up and there, hanging from a rafter nail was a hubcap. Now, my parents never owned anything, but Chrysler vehicles, with 2 exceptions... a 1957 JEEP Wagoneer and a 1970 International Harvester SCOUT. This was MY hubcap! (I never owned a Chevy either). My childhood neighborhood was one big playground for my cousins and the other neighbor kids. We roamed all over, often only heading home when we heard one of our parents calling us in from the front porch. My Dad's kidcall went like this, "RAAAAAAAAAYMUUUUNNND, COME HOME FOR DIIIIINNNNNER!" You could hear it anywhere in the hood and you could smell dinner as you got closer, because like most folks back then, we did not have air conditioning, so the windows were open. On Summer and weekend nights, we went back out after supper. Sometimes we played neighborhood tag in which one person was "IT" and everyone else hid ... well... anywhere. There really weren't boundaries, so this game while fun, often ended with a frustrated "IT" person getting mad and loudly announcing, "Okay, I quit. I'm going home!" Somewhere around the age of 13, we learned of a new game, called "Hubcap", from some older kids. 1. Get a hubcap ... preferably legally. 2. On a dark night, pick a spot with clear escape routes just in case. 4. After sunset, hide and wait for a car to approach. 5. As soon as the car passes your location, toss the hubcap and yell, "Hey mister, your hubcap came off!" 6. When the car stopped and began to back up, run out, grab the hubcap, and keep on running to avoid the driver with no sense of humor. 7. Regroup, reload, and do it again. 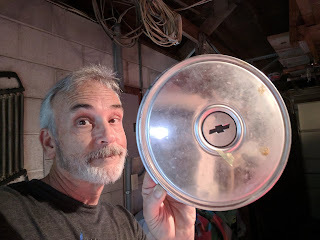 At some point, after the shine had worn off the Hubcap game, we found an old purse. It was empty but intact and it inspired a whole new night game called "Pocketbook". "Pocketbook" was a direct descendant of "Hubcap"
Pocketbook had similar rules and was played at dusk or dark, much like Hubcap. To play Pocketbook, we first attached a long length of 20-pound test monofilament fishing line to the handle of the purse. The purse was then left on the edge of the road in plain view, but not out far enough to be run over. The other end of the line was in our hands of course. Once the purse was in place, we waited like any good fisherman does. Looking back, it seems very few cars can pass a purse on the road without inspecting it. As soon as the car stopped, and the door opened, we'd pull in that purse as fast as we could and scoot. The drivers' responses were a mix of laughter and profanity mostly. (Ours was entirely laughter). Once a guy gave chase, but it was our territory and we vanished into the night with our purse. Once, and only once, a lady jumped out the passenger side, tossed the purse in the back seat and the car zoomed off. The line tightened for just a second and then "ZING! ", it popped. I don't remember when we outgrew these games, but somewhere along the way to full teen status, they faded into our collective history...but not from our memories. Cautionary note: This was all back in the "Wonder Years" era. I don't advise playing either of these games today. The world is a crankier place. We played the same games in my neighborhood. Usually with the same results. I haven't thought about that in years, thanks for reminding me. Thank you for sharing these slightly naughty memories. Fun was sure different then wasn't it! I've been thinking of you and the losses you've had these past few years. What a time it's been. I'm glad you took this walk down the memory lane of your youth. You really remind me of my younger days. We played out in the streets of our neighborhood until our parents called us home for dinner. We never played the hubcap or purse game, but we did play the "knock knock" game. We knocked on neighbors' doors or rang the bell... and then ran. Thank you for reminding me. Sweet memories, FC. Here's to your happy, adventurous childhood and the family that loved and nurtured you. I had the same reaction, Robin. We played outside until the streetlights came on. It was a beautiful way to grow up. What a great story. I remember playing in the woods near my house and my parents yelling for us to come home for dinner. That doesn't happen anymore. Go slow and enjoy that time looking through your parents stuff. You'll be glad you did later. We found my dad's army uniform in a trunk in the attic. He was in Germany during WW2. I love these tales of your misspent youth! I hope your father's garage serves up many more! Oh my gosh that is hilarious. I never did anything remotely like that in my whole boring life. Ha ha!! great childhood memories- like others, I appreciate you ringing those bells. We did a lot of "camping out" on hot summer nights, with girls in a tent in one yard and boys in another. Not sure how the genetics of it worked but every family seemed to have a 9 year old girl and an 11 year old boy. It sounds horrifying now, but the boys would run into the middle of Woodward Ave in Royal Oak (later immortalized in the film 8 Mile, as it was the intersection of Woodward and 8 Mile) at 2 am and see if they could "take a whiz" between cars. Gads. The really funny thing is to listen to my kids, when they get together, talk about their shenanigans. So glad I didn't know about them then! And, as Robin notes, it's been quite the couple years for you. I'm so glad you have Liz and the children and the grands. Wonderful story. I lost my mother, my best friend and my first love last year, so I too have been going through mountains of stuff to determine what to keep, what to give away, what to throw away. I am so grateful for all the wonderful memories I have. And thankful that you, like me, have a nuclear family that can help you through this difficult time. I haven't checked the blog for a whiles I missed this one. One of our games was to throw the main electrical breaker at the end of a block of apartment buildings near where we lived. That was usually a Saturday morning job. We once lined up large snowballs across one of the main streets in our neighborhood after one of our rare heavy snows. We were really disappointed when the driver of the first car that had to stop rolled them out of the way. I don't know what we expected him to do.